The Grand Ducal decree of 16 September 2010 introducing equality between males and females with respect to the succession to the throne (Decret grand-ducal du 16 septembre 2010 introduisant l'égalité entre hommes et femmes en matière de succession au trône) was today published in the Official Gazette of Luxembourg, Mémorial B (Legilux.lu). The Lord Chamberlain's Office at the Grand Ducal Court announced on Monday this week that Grand Duke Henri by decree of 16 September 2010 had modified the regulations governing the succession to the throne of Luxembourg, something I commented on in my blog the day after, 21 June 2011. The text of the decree has now been added to my Luxembourg page (together with some other links which the readers hopefully will find interesting). I have also received a translation to the said press release, including the explanatory note, which has also been added to my website. I hope that all the documents will be used actively as a basis for further discussions on the royalty discussion forums and/or in comments to my blog. As far as I can tell, the decree doesn't really add much more than the Lord Chamberlain's Office told in the press release. There still seems to be some uncertainty about whether the new rules only apply to the children of Grand Duke Henri, or if they could also be retroactively used for the Grand Duke's siblings as well, meaning that Princess Marie Astrid and Princess Margaretha and their issue would surpass Prince Guillaume in the line of succession. Maybe I was a bit too categorical when I in my previous article on the succession law stated that "According to the press release the new rules only affect the descendants of Grand Duke Henri". The word first might be the key here. One correspondent has disagreed with me, reading the text to say that the new rule will be first applied to the issue of Grand Duke Henri and that in the unlikely extinction of the current Grand Duke's issue, his older sister's issue would come first. I suppose his interpretation is as plausible as my understanding (I have become less categorical by now). It would be interesting to get more opinions on this! I might try to contact a Luxembourgian legal expert to have a say as well. Postscript 1 August 2011: As mentioned above I have written to a Luxembourgian constitutional expert in order to get his comments on the modifications to the succession law and the various interpretations. Unfortunately I have not received an answer yet. The blogger Trond Norén Isaksen has taken the time to contact the Grand-Ducal Court to get more information. In the first article dated 29 June 2011 we are told that the court maintained that the law was not made retroactive, meaning that Princess Alexandra did not have succession rights. I found this hard to believe, as the court's statement certainly was contrary to the wording of the decree (and the press release). On 11 July 2011, however, it is stated that the court has informed that Princess Alexandra indeed is in the line of succession to the Grand-Ducal throne. This is in agreement with the most obvious interpretation of the decree, as I commented on in my first article (21 June 2011). The question remains, as pointed out above, if the changes to the succession law also apply to the other branches of the Grand-Ducal family. The question is what is meant by the word first, cf. the press release from the court as well as the decree ("erstmals"). One correspondent believes, as written above, that the changes could also apply to the other branches. I can understand why he thinks so, which is why I have decided to have an open mind on the matter. It remains an academic question, though, as the line of succession is secure enough. However, all the confusion the court has created goes against the very point of a succession law. The text of the law should be crystal-clear, one should not need to question who would be next in line after Grand Duke Henri's youngest son Prince Sébastien. I have been told that the Luxemburgian Parliament (Chambre des Deputes) is currently working on a constitutional amendment that is said to regulate the succession entirely on the constitution removing it from the realm of the family pact. I really hope that the Parliament will eventually make more clarity to the matter. «Belgrade, 22 June 2011 – His Holiness the Patriarch of Serbia Irinej served today at the Royal Chapel of St. Andrew the First Called a memorial service on the occasion of 50 years since the death of Her Majesty Queen Maria of Yugoslavia. The service was held in the presence of Their Royal Highnesses Crown Prince Alexander, Crown Princess Katherine, Prince Philip, Mrs. Alison Andrews, Mr. Manos Ioannidis, as well as members of the Advisory Bodies of the Crown. After the service, His Holiness the Patriarch of Serbia Irinej said that all deceased members of the Karadjordjevic Royal Family should be buried in the Royal Crypt at the St George Church at Oplenac where they rightfully belong. Following the commemoration, Their Royal Highnesses Crown Prince Alexander, Crown Princess Katherine and Prince Philip went to United Kingdom, where they will attend a memorial service that will take place in Frogmore, Windsor, where HM Queen Maria is buried. This ceremony will also be attended by members of the Royal Family, HRH Prince Vladimir and HRH Princess Brigitte, HRH Princess Lavinia and her husband Mr Austin Prichard Levy, HRH Prince Dmitri, HRH Princess Katarina, Lady de Silva, Sir Desmond de Silva and Victoria de Silva. The graveside commemoration will be served by Father Milun Kostic, Father Radomir Acimovic and The Right Reverend David John Conner KCVO Dean of Windsor. On the occasion of 50th anniversary since the death of Her Majesty Queen Maria of Yugoslavia , an exhibition was presented at the White Palace. The exhibition will be open for public from Wednesday, 22 June to Tuesday, 5 July during the working week at 12.30pm. Everyone interested should call the Office of HRH Crown Prince Alexander on 011/ 306 4075 at least one day in advance. The Grand Ducal Court of Luxembourg announced yesterday, 20 June 2011, that the Grand Duke in a decree of 16 September 2010, with authority in the Nassau Family Pact of 1783, has changed the internal regulations of the House of Luxembourg-Nassau in order to make the succession to the Grand Ducal throne gender neutral. Before the decree came into force,(*) Semi-Salic succession applied, meaning that the succession was "reserved firstly to all the male dynastic descendants of all the eligible branches by order of primogeniture, then upon total extinction of these male descendants to the eldest of the dynastic female descendants" (ATR FAQ). The succession was limited to the daughters of Grand Duke Guilluame IV and their descendants. According to the press release the new rules only affect the descendants of Grand Duke Henri, which I interpret as saying that the former succession rules are still in force for the other branches. It is not possible to be 100% sure of this however, as the decree has still not been made available. The explanatory note seems to say in footnote 6 that the modifications will be published in Mémorial B (the Official Gazette of Luxembourg) - as of today the last issue of Mémorial B made available is dated 17 June 2011. I have asked the court for a copy of the decree, but have not received a reply yet. Now, while I am pleased to hear that the succession law has been made gender neutral, I find it a bit strange that it took so long to announce the changes. And it is interesting that a constitutional monarchy still allows for the monarch personally to make such changes. A bit surprising, perhaps, that the complete text of the decree was not released together with the press announcement. In the explanatory note we are told that the ongoing work to modernize the Family Pact and the internal regulations is "in the process of finalization". The new rules means that Princess Alexandra, b. 1991, now has got succession rights, and because of her brother Prince Louis' renunciation in 2006, cf. the Luxembourgian media at the time (**), she is supposedly no. 3 in the line of succession - after her brothers Hereditary Grand Duke Guilluame and Prince Félix, but before her younger brother Prince Sébastien. I have tonight updated my Luxembourg page with the addition of the above-mentioned press release. The decree will of course also be added as soon as it has been published. (*) I take it that the decree came into force when the changes were announced, although the press release doesn't seem to say so explicitly. (**) The text of the renunciation has never been made public as far as I know, and it has not been explained satisfactorily what authority the decision was based on. It should also be added that Le Quotidien claims that Prince Louis kept his rights, but that his sons are excluded, bringing Princess Alexandra to 4th place. Princess Märtha Louise of Norway celebrates her 40th birthday on 22 September 2011. According to VG Nett 18 June 2011, Princess Märtha Louise's husband Ari Behn has in an interview with the TV2 show "God Kveld Norge" ("Good Evening Norway") confirmed that her birthday will be celebrated with a big party at the Royal Palace, hosted by Their Majesties King Harald and Queen Sonja. Besides the couple's friends, "culture personalities" and representatives of the official Norway are also on the guest list. The bi-weekly magazine Se og Hør's court reporter Kjell Arne Totland claims to know that he has known about the planned celebrations for some time, and he says that many foreign royals are expected, including guests from Sweden, Denmark, the Netherlands, Belgium and Luxembourg. The Royal Court has not wished to comment. Princess Nathalie of Sayn-Wittgenstein-Berleburg, youngest daughter of Princess Benedikte of Denmark and Prince Richard of Sayn-Wittgenstein-Berleburg, and Alexander Johannsmann, son of Heinrich-Wilhelm Johannsmann and Jutta Johannsmann, née Henkenjohann, celebrated their church wedding at the Evangelische Kirche, Bad Berleburg, on 18 June 2011. Their civil wedding took place on 27 May 2010. See also the official website of the Princely House of Sayn-Wittgenstein-Berleburg, where more details, including a guest list, can be viewed in a pdf file. For an even more complete guest list, go to Nobiliana Forum. 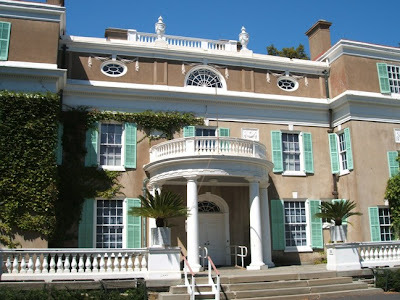 Springwood, Hyde Park, New York, birthplace and home of Franklin D. Roosevelt (1882-1945), 32nd President of the United States (1933-1945). The photo table shows among others the portraits of (the then) Crown Prince Olav of Norway and his wife Crown Princess Märtha, née Princess of Sweden (and Norway!). 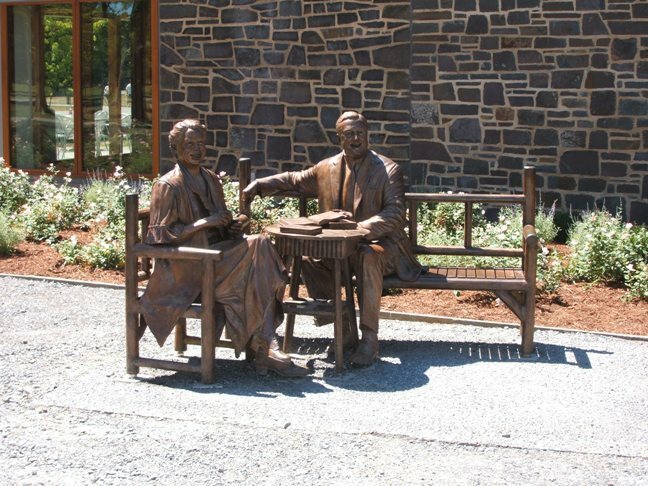 The royals met Roosevelt during their visit to the States in 1939 as well as during WW2. Not the sharpest photo, though. 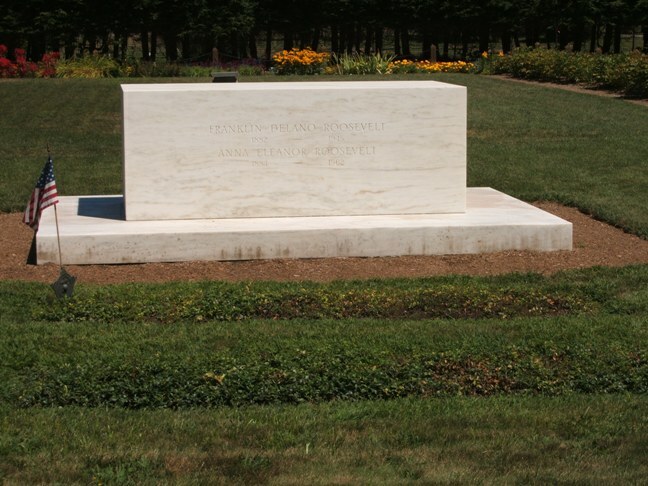 The grave of Franklin D. Roosevelt (1882-1945) and his wife Eleanor Roosevelt (1884-1962). 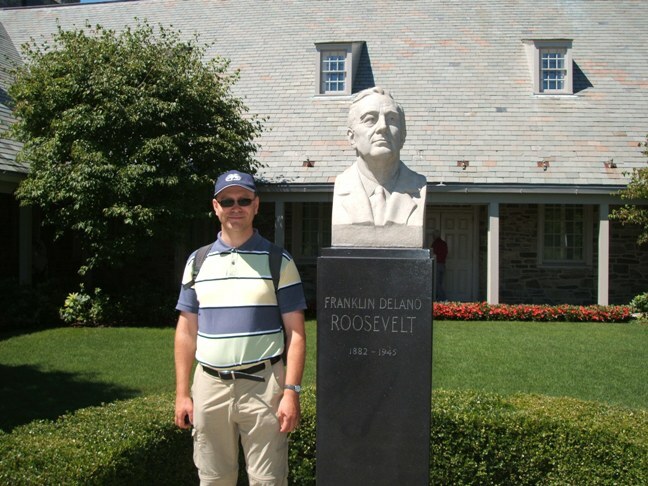 Inside the Franklin D. Roosevelt Presidential Library and Museum. Again the photo is not of the best quality... 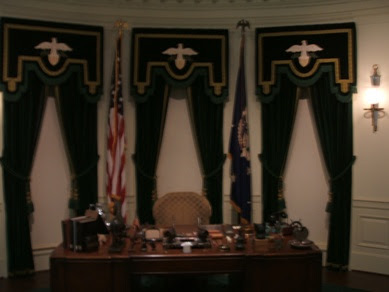 But it shows a replica of the Oval Office during Roosevelt's presidency. Springwood, the birthplace, life-long home and burial place of the 32nd President of the United States, Franklin D. Roosevelt, is a "must visit" for anyone interested in US presidential history, or US history in general for that matter. 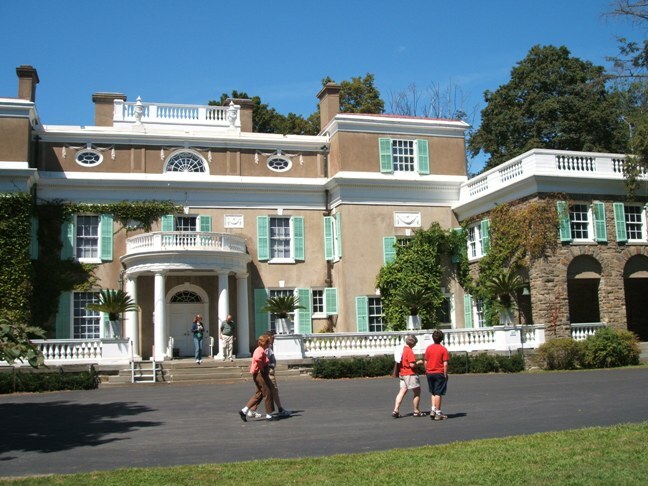 You will get a guided tour in the estate house as well as the neighbouring buildings and rose garden, where Franklin and Eleanor Roosevelt are buried. Then you can continue your visit at the Presidential Library & Museum. 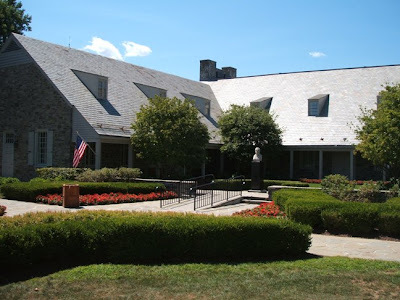 I have visited several presidential libraries as well (Lyndon B. Johnson, George H.W. 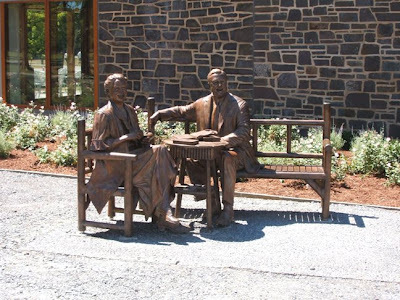 Bush and William J. Clinton), and feel that they perhaps could have done more out of Roosevelt's museum, but when you add Springwood to the visit, it still beats the others. I have explored other president-related sights in the United States as well, including Mount Vernon, the White House, the 6th Floor Museum and the Theodore Roosevelt Birthplace and will write about some of these visits later on. As you may remember, I have already written about the General Grant National Memorial in New York City. All the photos were taken in August 2006 during the last day of my fourth visit to the United States (I am not counting the stops at Miami in 2003 when I only changed flights on my way to and from Cancun, Mexico). 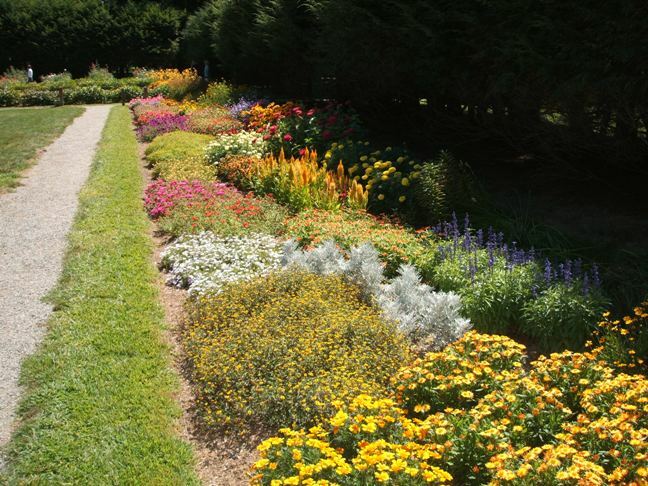 My visits to the United States so far took place in 1999, 2000, 2005, 2006, 2008 and 2009, and it is a great possibility that I will cross the Atlantic once more in 2012. The home of Franklin D. Roosevelt, which from 1945 has been administered by the National Park Service as a National Historic Site, is situated at Route 9 in Hyde Park, New York, about 90 miles (144 km) north of New York City. 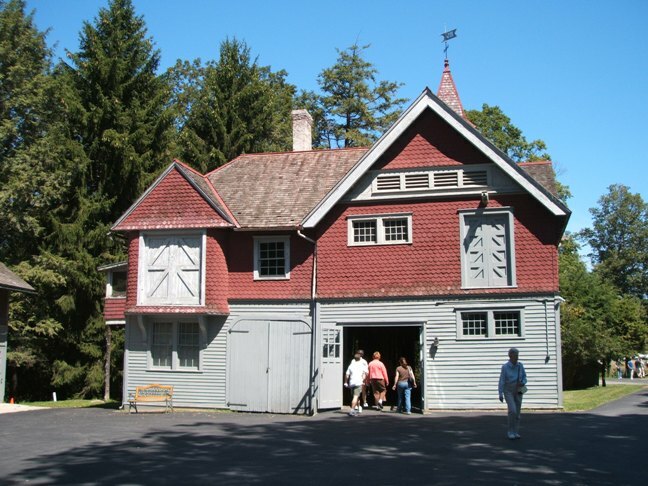 It is perhaps most convenient to travel to the historic site by car (about 2 hours' drive from NYC), but you can also take the train to Poughkeepsie (oh, I love the sound of that name!) and then tabe a cab (5 miles). If you plan to stay over in the area, you are recommended to make a reservation in advance, especially in the summer season. For other photographs, see for instance D & D Travel - A Look at the Hudson River Valley and Hyde Park, New York as well as the blog Reflections from a global perspective (21 February 2011). Today, 7 June 2011, it is 75 years since Queen Sonja of Norway’s brother Karl Herman Haraldsen died in a tragic sailboat explosion in the Oslofjord. 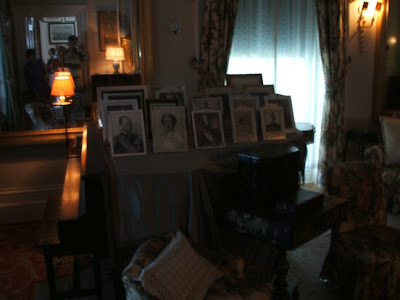 The accident can be said to have had a more direct impact on the history of the Norwegian royal house than we have perhaps realized earlier. The death announcement was published in Aftenposten’s morning edition 9 June 1936 No. 283, and repeated on the 10th and 11th. «Vår lille elskede Karl Herman omkom igår ved ulykkestilfelle, 7 år gammel. / Oslo, 7. juni 1936. / Dagny og Karl A. Haraldsen / Håkon og Gry» («Our little beloved Karl Herman died yesterday by an accident, 7 years old. / Oslo, / 7 June 1936. / Dagny and Karl A. Haraldsen / Håkon and Gry»). The text is somewhat misleading, but obviously delivered to the newspaper on 8 June, hence «yesterday», but the announcement was first published on the 9th. The name of Queen Sonja’s brother Haakon was misspelt in all the announcements. Queen Sonja of Norway, née Haraldsen, b. Oslo 4 July 1937, was the fourth and youngest child of Karl August Haraldsen (1889–1959) and his wife Dagny, née Ulrichsen (1898–1994). Sonja's father Karl was an avid sailor and had won several cups in sailing competitions. As told by the more or less authorized biography «Sonja: Norges Kronprinsesse» by Randi Bratteli/Sissel Lange-Nielsen (Oslo: Aschehoug, 1983), many of Karl’s friends owned a sailboat, too, and on 7 June 1936 he was helping his friend to take home a boat which had been stored for the winter at Drøbak. Karl August’s youngest son, the 7 years old Karl Herman, joined him and his friends. Tragically on the trip home, just before 5 p.m., the boat exploded, due to some petrol on the deck. Little Karl Herman and his father were thrown overboard. Karl August damaged his head. They never found the boy... Dagny Haraldsen later said that she never cared for looking after graves because her son never got one. The only comfort she found then and in all the years that followed was the thought that she could have lost them both. Eventually also her husband died at an early age, but that was 23 years later. The accident was covered by the national newspapers. Aftenposten even put the accident on the front page in the evening edition on 8 June. It had not got all the facts right. The newspaper claimed, as did Morgenbladet (which also brought the story on tis front page), that the sailboat (with an engine) was owned by Haraldsen himself, but here I have more faith in the information from the biography. The press reports disagree about the exact place of the boat explosion. But it seems that the accident took place approximately in the middle of the fjord east of Gåsøya (spelt Gåsøen then) and somewhere between the archipelago Steilene and the rock of Ildjernsflu (see draft). The press reports also disagree about the number of passengers – 4, 5 or 6. But only 4 people were named – Karl August Haraldsen, his son Karl Herman, (company) manager Gundersen and manager Gunnar Winther. 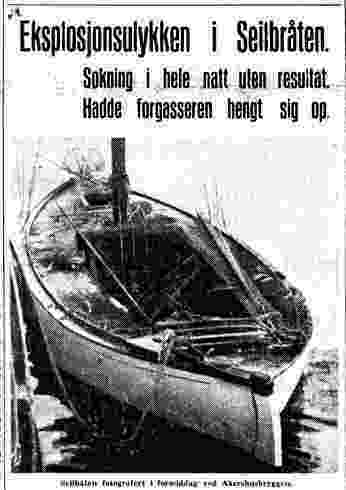 I don’t know if there was ever drawn a conclusion about the cause of the accident, but Morgenbladet’s hypothesis – which although more detailed, corresponds with Dagny Haraldsen’s version – that a leakage from one of the petrol tanks had lead to the development of gas and together with some petrol on the deck had been ignited by the flame of the primus used to make coffee. As already mentioned, the Haraldsens were thrown overboard, and little Karl Herman’s body was never found. Karl August got a minor head injury as well as a burn on his back, while Winther damaged his face. Another boat owned by retailer Matheson came to their rescue and brought them into Ingierstrand. A cargo boat named Viking took care of the burning boat. After the fire was put out, it was taken to Akershus wharf in Oslo. Little has been published about little Karl Herman other than that he died in an accident 7 years old. It is therefore little to be said about the little boy’s short life and his personality. In Bratteli and Lange-Nielsen’s biography of the then Crown Princess Sonja, he was described as an «attpåklatt», an «afterthought», as he was born 5 years after the last of his two elder siblings. He was probably like most small boys – happy about new adventures – he was for instance described as being very thrilled about the prospect of the sailboat trip from Drøbak to Oslo. He was said to be «a dear little thing» and very attached to his mother. Maybe he was a «mummy’s boy» (in the better sense of the expression)? 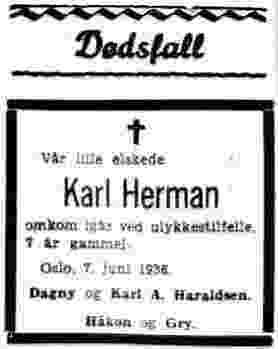 A few facts can be added to the story: Both the birth register as well as the Bratteli/Lange-Nielsen biography tell that Karl Herman was born at Josefinesgate 29, third floor, on 31 March 1929 as the third child of the retailer (shopkeeper) Karl August Haraldsen and his wife Dagny, née Ulrichsen. Also his two older siblings Haakon (b. 1921) and Gry (b. 1924, d. 1970) were born in their parents’ apartment in Josefinesgate 29, situated in Homansbyen not far from the Royal Palace. The birth of Karl Herman was officially registered on 23 April 1929 following the written declaration by the child’s father. The birth was also registered by Helserådet (the Health Council). The record of his christening is not available, but it most likely took place at Uranienborg kirke (church). According to the records of the Aker skifte- og auksjonsforvalterembete (Aker Probate Court and Commissioner of public sales), «Karl Herman Haraldsen, b. 31 March 1929 in Oslo, living at Tuengen allé 1b by his parents, died in a boat accident in the fjord outside Gåsøen. Not found.» In the commentary column it is added that the deceased left behind 2 Norske Liv gift (insurance) policies worth 5000 NOK each. A death certificate was not produced. The death was reported on 12 June 1936 by Mrs. Engelstad, Bogstadveien 52. Mrs. Engelstad was Dagny Haraldsen’s sister Berna «Mimi» (1894–1993), married to agent Einar Andreas Engelstad (1888–1961). The biography about Sonja doesn’t say anything about the Haraldsen and Ulrichsen families’ relationship with the church, but it tells that following the accident, Mrs. Haraldsen found a deep and personal faith, «talking to the Lord as to her best friend». Dagny and Karl Haraldsen decided that the only way to help them getting on with life again was to have another child. The labour started in the afternoon on Sunday 4 July 1937 and Karl, who had been at the beach with Haakon and Gry – it was a very warm July day – returned home around five thirty and drove his wife to the Red Cross Clinic in Frederik Stangs gate. The little boy who died had been a Sunday child (and had died on a Sunday as well, which was not commented on in the biography, though) and now it was Sunday once more. Dagny really wanted that the new child to become a Sunday child as well. The midwife thought she would make it. At 8.30 p.m. a baby girl was born. «People around me were moaning about the heat,» Mrs. Haraldsen recalled, «but I was in Heaven. I was there with the little girl. A Sunday child is supposed to be lucky, it is something especially bright with a Sunday child.» The little girl resembled her late brother. 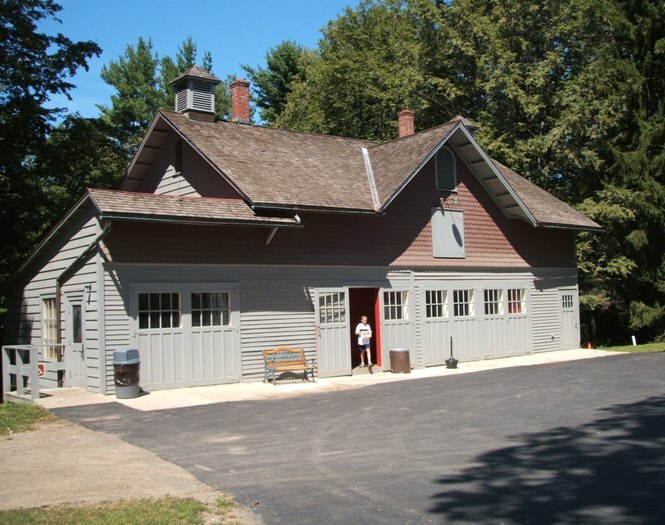 Dagny Haraldsen thought everything was meant to be.